In previous posts, I’ve mentioned Robert Crumb’s volume of international 78rpm records titled Hot Women, which features female vocalists. On it, he included Part 2 of an exceptionally wild recording made somewhere in East Africa in the early 1930s. Today’s post is Part 1 of that fascinating record. Decca Records in the United States began in 1934 (after truly beginning in England in 1929), and kept their maroon label for their international series. A large portion of the music released on that international series was from this hemisphere, but they did release some imported recordings, many of which were taken from German Odeon and Parlophon masters as the label indicates here. Most famously, American Decca found success in repressing Erich von Hornbostel’s influential “Music of the Orient” collection, which contained some recordings from as early as the ‘teens. You can still find a complete set if you’re patient. 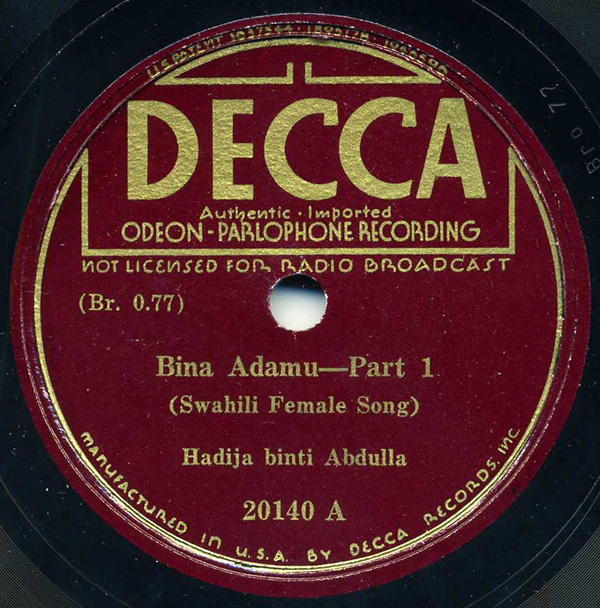 Much more difficult to track down, however, are examples from Decca’s African series. Unfortunately, without a trip to a vault somewhere in Europe to dig through ancient paperwork (if it exists), and without a vintage catalog which might contain more information, there’s no way to tell where this record was precisely made. It could have been Kenya, it could have been Tanzania, Rwanda/Burundi, or Zanzibar. My best possible guess, considering the strong Arabic influence in the instrumentation (oud, violin, and percussion), is that it is taarab music from Tanzania or Zanzibar, but that is only a guess and nothing more. Or, might the two letter matrix code – BR – stand for Burundi/Rwanda? I’ve a very similar sounding 78 that is definitively from that particular region. But, who knows. What I do know is that this vocalist will jolt you upright and rightly so. This is a one of a kind performance – just listen to her straining near the end of the piece. For more vintage taarab music from the region, definitely check out the beautiful CD Poetry and Languid Charm on Topic. It’s about time I left a comment. I’ve been visiting Excavated Shellac regularly for over a year, and am amazed not only by what you have, but how much you know. I used to snag foreign records off the floor of junk shops just to travel in time and hear unfamiliar sounds–never knowing where things came from, nor what was being sung about. As obscure as Bina Adamu part 1 is, it is an old favorite of mine from a worn-out LP my sister had. For 28 years I’ve been listening to a cassette tape, now wav file of a cassette tape, of the worn-out LP reissue. Thanks to you I am listening to parts 1 & 2 (I didn’t even know there was a part 2) in much HIGHER low fidelity. Thanks. Thanks, Bob – comments like yours mean a lot to me, really. I had no idea it was reissued on a long-ago issued LP, either! Fascinating. It’s quite a piece of work. Whoops – I see now that it was long ago released on LP, on a Folkways compilation. I generally don’t like to double-up on anyone’s music – so I will most likely make this track unavailable sooner rather than later. My bad! Sometimes it’s hard to keep up! A friend just forwarded this to me. Looks like one the recordings done by the German Odeon Co. in Mombasa in 1931. Actually, I think the track on the Folkways LP is another song by Siti Bint Saaad, a singer from Zanzibar. I will have to check my files/collection. — For more information on the record trade and early taarab recording in East Africa check: Werner Graebner, “The Interaction of Swahili Taarab Music and the Record Industry. A Historical Perspective.” in: African Media Cultures – Transdisciplinary Perspectives, ed. by Frank Wittmann & Rose Marie Beck. Koeln: Rüdiger Koeppe, 2004. Bina Adamu is Swahili for “human beings”, literally Sons of Adam. My guess is Zanzibar. It would be great to get a Swahili speaker to translate the whole song. The instrumental introduction is a melody commonly used in Egyptian maqamaat 100 years ago. As a Decca, this was issued around the eve of the Second World War. It’s curious how the masters made it to Decca. I wonder who conceived of issuing these African records here. McBride’s Disc Shop in Hollywood, California, (“Imported and Domestic Records – Crossroads of the World”) assembled a group of these African and Balinese Decca/Odeons and sold them as a set I believe around the late 1930s/early 1940s. Somebody had the bug even back then. If you can hunt down the McBride family and locate the store stock of ethnic 78s, everybody might be able to stop collecting records. Thanks for your great website. I wish I had the time to do the same.